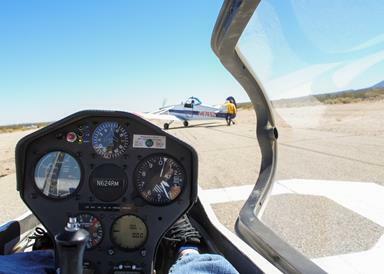 Edwards AFB – The Southern California Soaring Academy, located at Crystal Airport in the Antelope Valley, is open to the public four days a week, Friday through Monday. On the days when the academy is closed, the non-profit organization uses their resources to encourage wounded service members and veterans through their Wounded Service Member Glider Program. 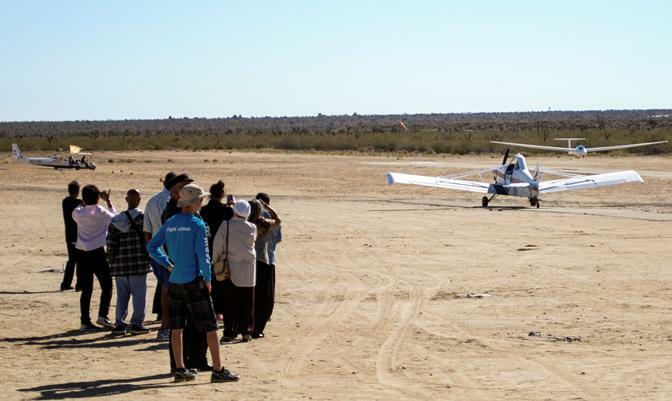 Each day of soaring is accompanied by a barbecue that is organized by one of a number of rotating volunteer groups. The volunteers are responsible for cooking and serving the food, and on occasion, supplying it. The pilots, many of whom are military retirees, are also volunteers. The very first soaring event took place July of 2011 and served around 25 participants from the Naval Medical Center in San Diego. Today, the event has grown to include groups from the Veterans Administration Medical Centers in Long Beach, Loma Linda and West Los Angeles. Prior to participation, the VA must provide a medical clearance and transportation for the veterans. The staff strives to create a “protected environment” for the veterans by hosting the event on days when spectators cannot access the airfield and ensuring that all volunteers have gone through proper training. “It should feel as if they were going to a friend’s house for a backyard barbecue,” said Bennett. She added that two local residents regularly provide seasonal baked goods such as cakes, cookies and pies for the barbecues. Some of the previous volunteer groups have included Outback Steakhouse, Edwards AFB groups and active duty members of the USAF ASC/WII OL Detachment 3 at Grey Butte, Calif., commanded by Lt. Col. Nate Titus. The volunteers typically average 10 hours of work per soaring day which adds up to approximately 1,600 man-hours of volunteer effort per year. Because of the volunteers, the academy was able to offer over 200 wounded warrior flights in 2012. According to Bennett, some of the participants served in World War II or Vietnam and they “shed tears” when they hear that the volunteers are there to provide a “fun day” just for them. During their regular business hours, the academy offers ground school and flight training in gliders. A portion of funds raised from those services, along with donations, are then used to support the Wounded Service Member Glider Program. With the glider program fully established, SCSA has started to reach out to school groups. Their goal is be available for field trips that will introduce students to aviation and relate that to the Science and Math they are already learning in school. To learn more about the Wounded Service Member Glider Program, visit http://www.soaringacademy.org/give-back/.